One of the great things about living in Florida, is we have excellent weather. Almost throughout the entirety of the year, we are able to sit outside and enjoy the great weather and soak up the sun. Especially now. When everyone is nestled in their homes blasting their fireplaces trying to stay warm, we are chilling outside enjoying the warm weather. This is the perfect reason why you must incorporate an outdoor cabana to your home. At Sundance Architectural Products, we are experts. Orlando trusts us as having the best powder coating near me. Mother Nature indeed is beautiful. To fully appreciate the wonders of outdoor living this summer, regardless of the weather, an outdoor covered structure that brings the indoors out, and the outdoors in, might be the answer for you. Rain or shine, you can take advantage of this great installment to your home. Here is all the information you need to know. We are experts on planning the location to function and cost, as you consider building a covered structure for your home. Just think about it. The sky is practically the limit as you imagine your covered structure. There are so many fantastic options to consider as well as possible restrictions. The following steps we list are intended to aid your thinking, prioritize your planning, and present you with the assortment of possibilities that can make your cabana uniquely represent you. Also be sure to ask us about the best powder coating near me, today. What are you using your cabana for? Where is going to be located? Have you thought about the design? How is it going to become a reality? Is there anything special you wish to incorporate? What will set your cabana part from everyone else’s? How are you paying for the cabana? The best part of the overall experience. The cabana can be your main entertainment space, your primary dining area or your oasis for relaxation no matter what Mother Nature has in store. You might find yourself pleasantly surprised by how much you use your new space, and just how much you love it. Give your pool the outdoor cabana it deserves. We are experts. 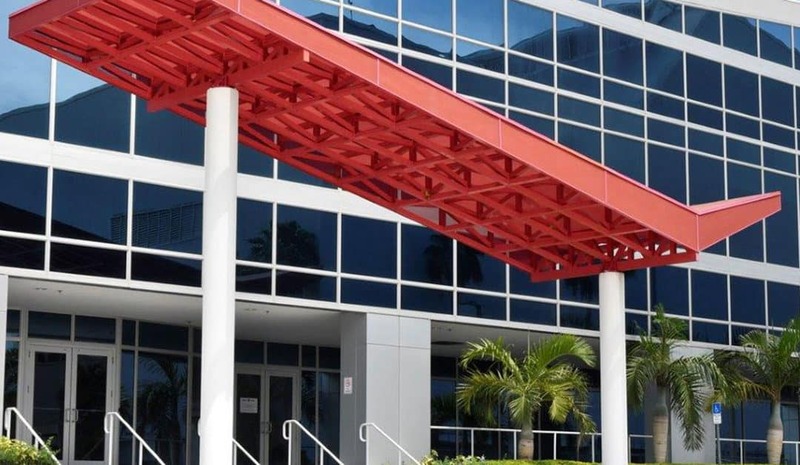 Since 1984 Sundance Architectural Products has been employing industry leaders dedicated to providing superior quality turn-key solutions through custom design, manufacturing, and installation of commercial awnings, canopies, solar shade systems, and exterior metal wall panels. We are here for you! We are the only specialty contractor offering such an extensive line of exterior architectural elements, allowing you to bundle all the elements into one contract. Saving you both time and expense. Call us today for more information, Orlando. We also offer the best powder coating near me.